Western blot analysis of extracts from various cell lines using CD36 (D8L9T) Rabbit mAb (upper) and β-Actin (D6A8) Rabbit mAb #8457 (lower). Expression of CD36 was induced in the THP-1 cell line using TPA #4174 (80 nm, 16hrs). 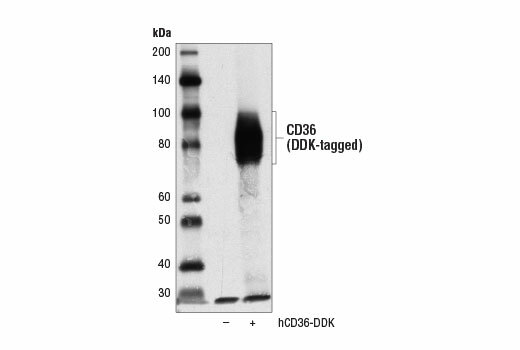 Western blot analysis of 293T cells, untransfected (-) or transfected with a construct expressing DDK-tagged full-length human CD36 protein (hCD36-DDK, +), using CD36 (D8L9T) Rabbit mAb. 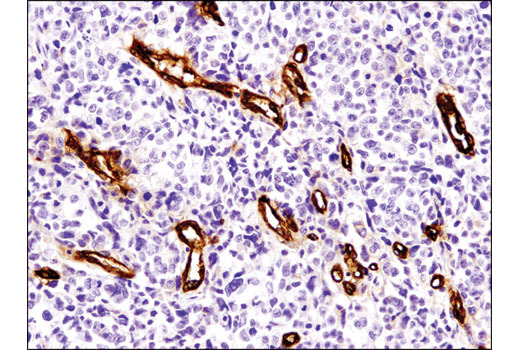 Immunohistochemical analysis of paraffin-embedded human ovarian carcinoma using CD36 (D8L9T) Rabbit mAb. Immunohistochemical analysis of paraffin-embedded U-937 (left) and Jurkat (right) cell pellets using CD36 (D8L9T) Rabbit mAb. 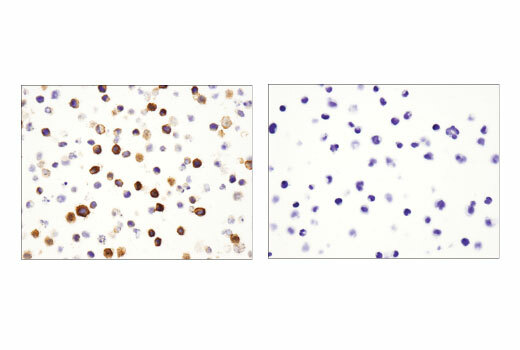 Immunohistochemical analysis of paraffin-embedded human adipocytes in breast carcinoma using CD36 (D8L9T) Rabbit mAb in the presence of control peptide (left) and antigen-specific peptide (right). 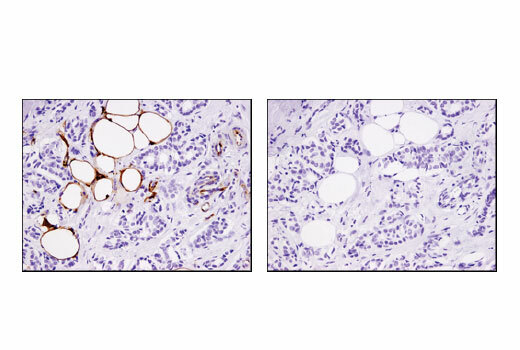 CD36 (D8L9T) Rabbit mAb recognizes endogenous levels of total CD36 protein. 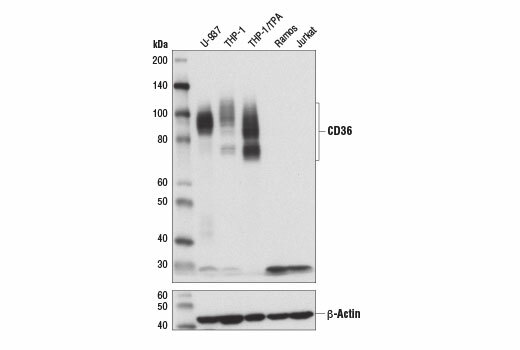 This antibody also cross-reacts with an unidentified protein of 30 kDa. Monoclonal antibody is produced by immunizing animals with a synthetic peptide corresponding to residues surrounding Val112 of human CD36 protein. CD36 is a class B scavenger receptor composed of short amino-terminal and carboxy-terminal cytoplasmic domains, two transmembrane domains, and a large glycosylated extracellular domain (1-4). The CD36 receptor has many diverse ligands and cellular functions and is expressed by multiple cell types, including monocytes, macrophages, platelets, endothelial cells, adipocytes, and some epithelial cells (1). Binding of thrombospondin-1 (TSP-1) to CD36 facilitates the inhibition of angiogenesis by TSP-1 (5). CD36 also binds lipids and enables their transport into cells (6). In macrophages, CD36 acts as a receptor for oxidized LDL (Ox-LDL) and is responsible for Ox-LDL internalization, which contributes to development of atherosclerosis (7). The CD36 receptor participates in the innate immune response by acting as a pattern recognition receptor for lipid components of bacterial cell walls and fungal beta-glucans (8,9). CD36 likely influences signaling by interacting with other cell surface receptors including TLRs, integrins, and tetraspanins (8,10,11). Phorbol 12-myristate 13-acetate (PMA)/ 12-O-tetradecanoylphorbol-13-acetate (TPA) induces CD36 expression in the THP-1 monocyte cell line (12). Asch, A.S. et al. (1987) J Clin Invest 79, 1054-61. Armesilla, A.L. and Vega, M.A. (1994) J Biol Chem 269, 18985-91. Tandon, N.N. et al. (1989) J Biol Chem 264, 7570-5. Endemann, G. et al. (1993) J Biol Chem 268, 11811-6. Dawson, D.W. et al. (1997) J Cell Biol 138, 707-17. Kim, Y.R. and Peterkofsky, B. (1997) J Cell Biochem 67, 338-52. Nicholson, A.C. et al. (1995) Arterioscler Thromb Vasc Biol 15, 269-75. Hoebe, K. et al. (2005) Nature 433, 523-7. Means, T.K. et al. (2009) J Exp Med 206, 637-53. Mattera, M.D. (1992) RN 55, 7. Miao, W.M. et al. (2001) Blood 97, 1689-96. Alessio, M. et al. (1996) J Biol Chem 271, 1770-5.